Fernand Léger’s China Town of 1943 is a rare and singularly accomplished painting that was created during the artist’s longest visit to America. Its visually arresting compositional attributes are distinctively typical of the sixty-two year old artist’s mature oeuvre in the last decade of his life. Léger moved from Paris and stayed in the United States from November 1940 to November 1945. He was artistically active and, at various times, lived in Hoboken, Oakland, San Francisco, Los Angeles, Carmel, Franconia, Osterville, Washington and, most eventfully, in New York City where the present painting found its inspiration. Léger’s China Town of 1943 is firmly rooted in the animated vivacity of that bustling metropolis. Léger found ready assistance in New York. This came, most especially, from Nelson Rockefeller, the billionaire President of the New York’s Museum of Modern Art and the automotive industrialist Walter Chrysler, the President of the Chrysler Motor Corporation and builder of Manhattan’s famed Chrysler Building. He also received the help and support of Pablo Picasso (1881-1973), Henry Miller (1891-1989), Igor Stravinsky (1882-1971), Alexander Korda (1893-1956), Jacques Lipchitz (1891-1973), Lásló Moholy-Nagy (1895-1946) and James Johnson Sweeney (1900-1986), the Senior Curator at MOMA. In short, America clasped Léger in a very, very warm embrace. Léger’s China Town has an emblazoned power. Its optical “punch” is almost heraldic in its compositional compactness and visual insistence. The secret to the painting’s extraordinary visual impact lies partly in its simplified planar background. For example, if one initially focuses attention upon the background alone it comes as a surprise that its simple four colours convey a hidden content – one that supplies some of the associational force that underscores the work’s visual power. That is, it comes as almost a shock that the colours, in hue, intensity and chroma, are those of the French national flag. The painting’s analogical underpinnings are further enhanced by the use of Chinese Yellow in the left section of the painting - sometimes called Royal Yellow or Imperial Yellow as tabulated in the then current American Munsell Color System. The fact that the shape of a blue palette-shaped form, complete with its circular thumbhole opening, overlies this yellow area supplies a visual clue that further decodes the painting’s iconographic substratum. the bottom) like a tanned hide to “float” above its telling four-colour background. All of these shapes, one might surmise, were briefly glanced by Léger in the exotic forms of Chinese hanging ornaments and pressed-tin wind chimes – then recalled and reformulated in the interrelated shapes of the present painting. Furthermore, the shapes of lotus pods (common in Chinese soups) in the upper left; the tendrils of coral (common in Chinese restaurant decorations) also in the upper left; the gemstone amulets (popular Chinese adornments); the large mandolin vegetable slicer in the centre right (common in Chinese restaurant kitchens); the large double-bladed grater in the upper right (common kitchen implement); the Chinese moon cake with its bean paste centre in the centre right (common Chinese dessert); the scraps of torn and crumpled paper items in the upper and lower centre of the large central black “goat” shape (receipts, a restaurant bill, Fortune Cookie wrappers, perhaps a discarded drawing on a napkin) and even the steam “clouds” in the upper and lower right of the canvas all play their part in a symphonically reconstituted composition of recollected forms, that are almost pictographic in their simplicity. Considered in this way, the visual sources of Léger’s vibrant and confidently composed China Town of 1943 more than likely arose from a restaurant visit or a stroll through New York’s stimulating Chinatown neighborhood in Lower Manhattan – charmingly called China Town in the title of the painting, rather than Chinatown, since English was not Léger’s native tongue. In the present painting Léger has analogised the sum of the exotic experience and metamorphosed its unusual object in a semi-abstracted harmoniously balanced Synthetic Cubist composition. Cubism is an exquisitely nuanced and subtle art movement that is rarely explained. Cubism, founded in 1907, attempted to give painting a new form of visuality and to promote the view that realism in art exists not so much in visual perception and surface appearance and the accurate depiction of that appearance, but in one’s intellectual manipulation and construction of a reality in and on the canvas. It aimed to add a new “thing” to reality – that is, a creation rather than a re-creation. By way of explanation: in jazz music, the piano is not expected to copy, replicate or imitate the sound of say, a waterfall, but to go beyond this simple ambition and present a musical interpretation of that waterfall, one that uses the waterfall as a departure for a musical composition; a composition that gives a fuller appreciation of “piano-ness”, of what a piano can do, of what a piano can produce, of how the piano relates to other sounds and how the sounds of the piano fit with an extended conception of music - in fact, of a new musical composition. In similar ways, the forms of Cubism may be seen to be visual extensions of real forms and appearances that invite viewers to contemplate the various shapes of Nature and “things” in the world anew and in ways that emphasise their relationships to each other to enlarge one’s perception of their place in artistic compositions – in and on the canvas. Cubism is not a symbolic art; it does not derive its meaning from the external world of meaning, tradition, literature, philosophy, anecdote, illustration or mythology. Cubism is always an art of content rather than meaning. Cubism therefore has no distant views, no panoramas, no generals on horseback, no nostalgic landscapes, no history painting, no allegorical murals, no moral lessons and no social doctrine – all of which is elliptically explained in Albert Gleizes and Jean Metzinger’s Cubism of 1912 – the first major text to analyse the nascent art movement. Correctly considered, the Cubist painting stands as a lesson in itself; that is, as a painting bearing little reference to a world beyond that which is depicted within its frame. In this sense, the Cubist painting refers to nothing but itself. Léger’s China Town of 1943 stands in very good company indeed – historically, technically and aesthetically. It is closely related stylistically to his large The Divers of 1942 in the collection of New York’s Museum of Modern Art, particularly in its background and “floating” central cameo-shaped mass of black and white forms. Furthermore, it shares very close aesthetic affiliations with his Les plongeurs en rouge et bleu (Divers and Red and Blue) of 1943, which recently attracted the price of AU$2,572,000 (IBP) and his Composition aux deux papillons (La femme aux papillons) (Composition with two Butterflies, (Woman with Butterflies), also of 1943, which was sold at auction for AU$4,962,820. It is worth noting that these latter two paintings differ from the present work in their pronounced emphasis upon humanoid shapes. 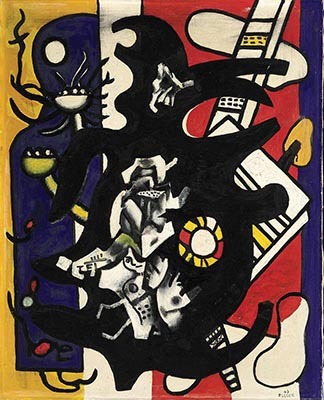 Léger was cautious about human figuration in his paintings, since it seemed to accentuate an undesirable “humanistic” or “anthropocentric” reading of the “all-overness” and visually democratic multiplicity of his shapes – despite the fact that his humanoid shapes became more prominent in his Post-War paintings. Keeping Léger’s caution in mind his China Town of 1943, with its clear lack of human figuration, stands as a hallmark work that echoes the well-established aesthetic achievements of his earlier Pre-War French masterpieces. Léger’s China Town of 1943 prefigures some aspects of American Pop Art, most notably in the works of Roy Lichtenstein, especially in its everyday subject matter, its bright and flat primary colours, its pictographic linearity and its edge-to-edge forceful frontality. Léger’s assured and jaunty China Town of 1943 resonates with the artist’s happy circumstances in America. The painting’s remarkable verve and aesthetic finesse is exceeded only by the artist’s acute attentiveness and observational panache. Dip. Art; T.T.T.C. ; Fellowship RMIT; MA; PhD.